Spanish Phrase of the Day: Happy 4th of July! This is a great Independence Day. I am blogging from Marco Island, FL with my family. I wanted to point out an excellent article about the Founding Fathers. It's easy now, in a nation awash with complaints about what our Founders did not do, what imperfect humans they seem to 21st century eyes, to overlook how startlingly bold their views and actions were in their own day and are, in fact, even today. 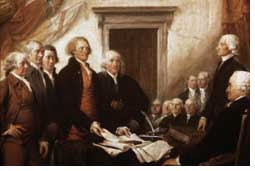 Who else in 1776 declared, let alone thought it a self-evident truth, that all men were created equal, entitled to inalienable rights, or to any rights at all? How few declare these views today or, glibly declaring them, really intend to treat their countrymen or others as equal, entitled to life, liberty and the pursuit of happiness? Certainly not America's 20th century enemies, the Nazis and communists; certainly not today's Islamic radicals, who consider infidels unworthy to live and the faithful bound by an ancient and brutal code of law. We are fortunate that the Founders of our nation were enlightened, generous, jealous of their rights and those of their countrymen, and prepared to risk everything to create a free republic. More tragically, some seem to enjoy vilifying America, everything it has been and stands for, seeking and finding fatal shortcomings. Adams and Jefferson were not blind to those shortcomings. "We think ourselves possessed or at least we boast that we are so of Liberty of conscience on all subjects and of the right of free inquiry and private judgment, in all cases and yet," Adams admitted, "how far are we from these exalted privileges in fact." Recent moments of real unity after 9/11, when members of Congress stood together on the steps of the Capitol and sang "God Bless America," have been fleeting. I hope that we remember the sacrifices of those that preceded us, in order to honor them appropriately.